A hike on Dercum Mountain doesn’t require lungs of steel and legs like tree trunks. 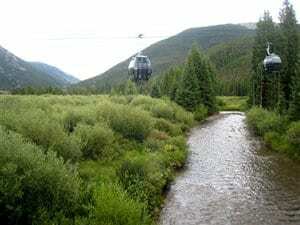 Take the River Run Gondola up and hike down Schoolmarm to get the most out of your stroll. Here are ten reasons to think down when planning a hike. Why struggle your way up to 11,640 feet? A 12-minute ride on the new River Run Gondola will do just fine. The ride will not only give you a chance to catch your breath, it’ll also let you scope out a great trail. Just like in the winter, trail signs are posted along the entire run, making it impossible to get lost. Take a winter trail map with you to move onto a more advanced (and steeper) blue or stick to the greens and save the knees. Catch a glimpse behind the scenes of Keystone Resort while scoping out runs for next ski season. Investigate a steep run you will attempt to conquer, learn where the best view is, and analyze which park features you will try to master. Walking down the mountain means you won’t be too exhausted when you reach the bottom two hours later. Plan your hike just right and you may have enough time to dance to the last few songs at any number of festivals held in River Run throughout the summer. 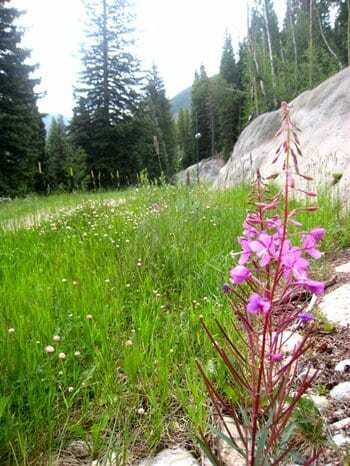 Going down a ski run means there is no hiking trail to abide by, allowing you to check out different views and wildflowers. Keystone hosts world-class mountain bikers during the summer on over a hundred miles of single-track, a pretty cool – and scary – thing to watch up close. Hiking a ski run lets you view these athletes from afar. It’s not uncommon to see a bird of prey screech and fly across the sky hiking down Schoolmarm, and it’s perfectly commonplace to see wildflowers blooming. As Keystone is such a biking destination, hikers are typically left to themselves. The quietness of Schoolmarm means you can actually hear the sounds of nature over your own breath. Unlike hiking up where you have to turn around to see the vista behind you, walking down the mountain means you get a view the entire way. On Schoolmarm, you trade a magnificent scene ofLakeDillon for a glimpse of the happenings in River Run. Hardly anything tastes better than a microbrew after exerting yourself, even if it was just slightly. Stop into any number of restaurants and bars at the base of River Run to finish strong.